I’ve had live chat on my site for a couple of years, and I can directly attribute $1000s to chats I’ve had with strangers, fence sitters and long term clients. And that’s just the chats I’m aware of the correlation between the chat and sale! But then after doors close, why would you take it off?! What sorts of questions do I get? Yes, it’s really me. I’m really here. How can I help you? What do all of these questions have in common?? They all allow me to help people directly, quickly, and with a personal connection/touch. It doesn’t matter what ‘stage’ our relationship is at… they could have literally just stumbled onto my website from Google, or they could be a long term fan/customer… but the ability for my audience to speak with me and get the help they need… that stands out in an increasingly automated world! Is this different to a messenger bot? Yeah, it is. Messenger bots are Facebook things. With bots, the person will be communicating with you through their Facebook account/messenger. 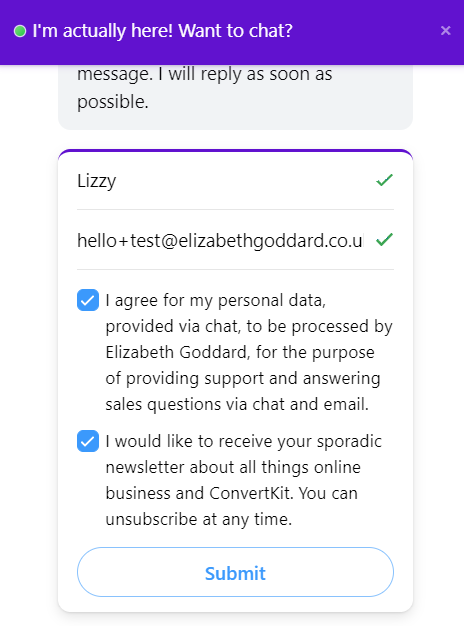 They’re kinda more like an email list in that you can send out messages to everyone ‘subscribed’ to your bot. Live chat is more of a standalone live chat/message service that’s totally done on your site/through your live chat system. Read on to learn more about why I love Chatra specifically! Is there any point if I’m not online much? Yes! I go days where I’m not ‘online’ at all. I still get lots of messages through my chat box as it’s much easier for people to contact me on the page they’re on without them having to faff about finding the Contact page. How do I know if I have a chat? You’ll get a noise notification. You can also download the app and get the notification on your phone too. 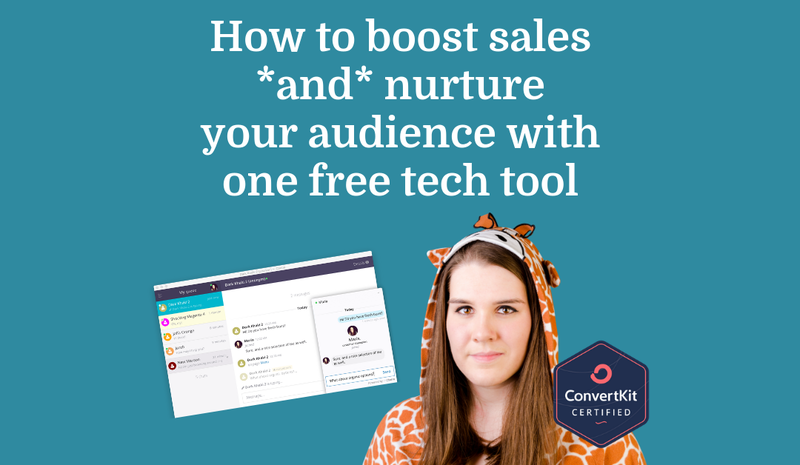 No, it’s not super scalable, but I’ve found that the personal touch of a live chat super impresses people and the time spent has a much higher financial ROI than most other things I could be doing in my business. Yep – click the button in the bottom right corner of this screen. If I’m online right now it’ll say, otherwise it will send me a message and I’ll reply soon. If you just want to test it, please tell me your favourite animal. It’s not super important how a tech tool looks in the grand scheme of things, but it sure is nice when everything is clean and pretty. I can’t tell you how many times I’ve wandered away from my computer, accidentally forgot to turn myself ‘offline’, and I’ve had a notification on my phone that someone’s chatting on my site. Total lifesaver. I can super easily respond on my phone from the Chatra app. Oh, and also the Facebook Page Messenger integration I talk more about below. The live chat tool I used before Chatra didn’t do this. If I forgot to change myself to offline, people just wouldn’t get a reply from me and it wasn’t a great experience for my visitors 😞 Thankfully Chatra solves this as I have the option to automatically turn myself offline if I don’t reply to a chat within a certain time frame. (Oh, and it also tells the person trying to chat with me that I’ll follow up later via email – phew). With a couple of clicks, when people first start chatting with you, you can give them the option to check a box to join your list. The vast majority of people check the box… and most of them weren’t previously on my list. I’m not saying it’s a flood of new subscribers, but every little helps! I don’t know about you, but I’m the worst at checking/replying to Facebook Page messages. I don’t seem to always get the notifications? Anyway, it can all be integrated with Chatra so you can receive and reply to Facebook Page messages right inside the app with all your other chats! 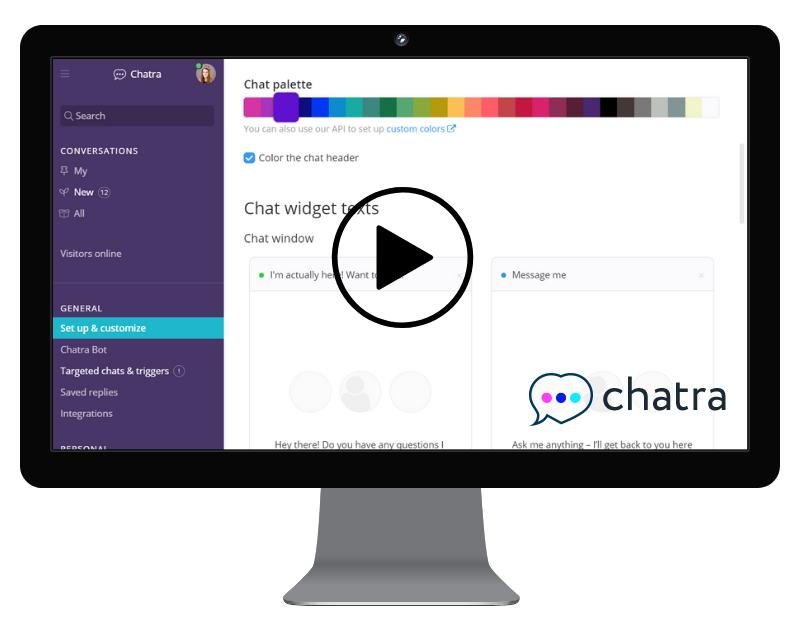 Ready to get Chatra live chat installed on your site and start wowing your audience and customers? Click here to start your free 10 day Paid plan trial! I’d love to know in the comments when you’ve had your first successful chat! I chatted with you abour Chatra and immediately ran to get one for myself! I loved loved loved chatting you up and, I dunno, ever since, I’ve literally felt like Ooooh a note from my good pal Lizzy whom I’ve literally never met! But I’m seriously like yes! Lizzayyyyy wrote me! She’s so awesome I can’t wait to read all the awesome stuff she’s sending me now! Without our oh-so-brief yet oh-so-hilarious Chatra sesh, I would never have believed a little doohickey in the bottom of my webpage could lead to a client going from “I just stumbled upon your site through sheer clicking down the rabbit hole” to feeling such a personal connection that never went away! Our Chatra session about Chatra led me to love your content so much that I rushed to open your latest email and clicked right on through to this post, read it straight through even though I already knew almost all the stuff you said (cause I’m a raving Chatra fan now too!) and even wrote a comment. Chatra made a stranger feel like a pal. And what’s more, it made your emails seem like more good times with my awesome pal Lizzy! I’ve only had Chatra like a month and a half and I already see its benefits! I love the “save reply” feature so very very much. It’s already saved me many minutes of typing. You’re the woman! Thx!!!! !